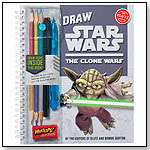 Draw Star Wars: The Clone Wars is packed with tips and techniques, practice space to draw right in the book, and translucent overlays to make kids a master of drawing. 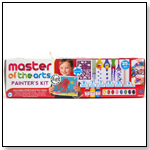 Start with stick figures, move onto basic shapes, and finish up with the details. Learn to draw 20 different Clone Wars characters. The book comes with everything needed, including a black marker, double-tipped metallic — colored pencils, and an always-sharp mechanical pencil. Of course, we also include perhaps the most essential tool for any artist… an eraser. — Mary Porter Green, owner of The Curiosity Zone in Ashburn, Va., told TDmonthly in a Summer 2011 survey that she sells "Klutz books of all sorts — dozens — especially Star Wars," each week.